Coal was very important back then. Coal is a black rock that can be used for fuel. It was used to run trains and steamboats. Albert “Ginger” Goodwin became a coal miner at age 15. That is how he found himself in British Columbia. There were lots of coal mining jobs on Vancouver Island. Coal mining was not a safe job. The coal dust made the workers sick. Sometimes gas in the ground made the workers sick, too. Sometimes mines caved in. Many miners wanted the right to be safe at work. So in 1912, some workers on Vancouver Island went on strike. Ginger was one of them. He spoke out for workers’ rights. When the strike ended, the mining company would not give him his job back. The company was angry that he had spoken out. So Ginger moved to the mainland of British Columbia. He continued to fight for workers’ rights. At that time, Canada was fighting in World War I. In 1917, the government made a law that all men aged 20 to 35 must fight in the war. Ginger did not believe in war. He also had many health problems from working in the mines. A doctor looked at him and said he was not fit to go to war. Ginger began to speak out against the law that forced men to go to war. Shortly after, he got a letter from the government saying he needed to be seen by a doctor again. This time, the doctor said he was fit for war. Many people were sure that the government was trying to get rid of him for speaking out. Ginger escaped to a cabin on Alone Mountain near Comox Lake. He was joined by some other men who would not fight in the war. People in the nearby town helped them hide by bringing them food and water. Police spent months looking for the men. A police officer named Campbell said he would get Goodwin dead or alive. One day in 1918, Campbell and two other police officers went to Alone Mountain looking for the men. The two police officers went one way and Campbell went another. Then the two police officers heard a shot ring out. They went toward the sound. They found Ginger’s dead body on the ground. Campbell had shot him. Campbell said he had to because Ginger pointed a gun at him. The police burned the cabin where Ginger was shot. Some people thought that it was a cover-up. They said it was not right that Ginger was killed. They thought the government finally got what it wanted. The government got rid of Ginger Goodwin. Miners and friends carried Ginger’s coffin on their shoulders through the streets of the town. People followed behind for six kilometres. That day, all the workers in British Columbia put down their tools and went on strike. They protested the shooting of Ginger Goodwin. It was the first general strike of British Columbia. Today, we wonder what really happened on that summer afternoon in 1918 on Alone Mountain. The word mountain contains the letters –ain like mainland and again. But it doesn’t have the long /a/ sound. See The Shooting of Ginger Goodwin in BC Reads: Adult Literacy Fundamental English – Course Pack 3. 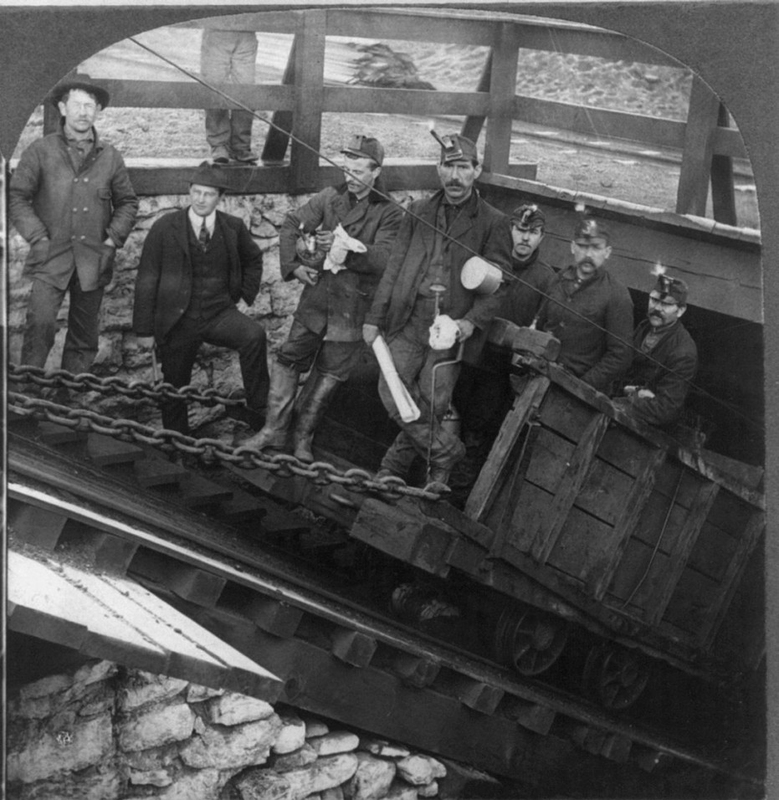 Hazelton coal miners by BaomoVW is in the public domain. This photograph has been modified (cropped). 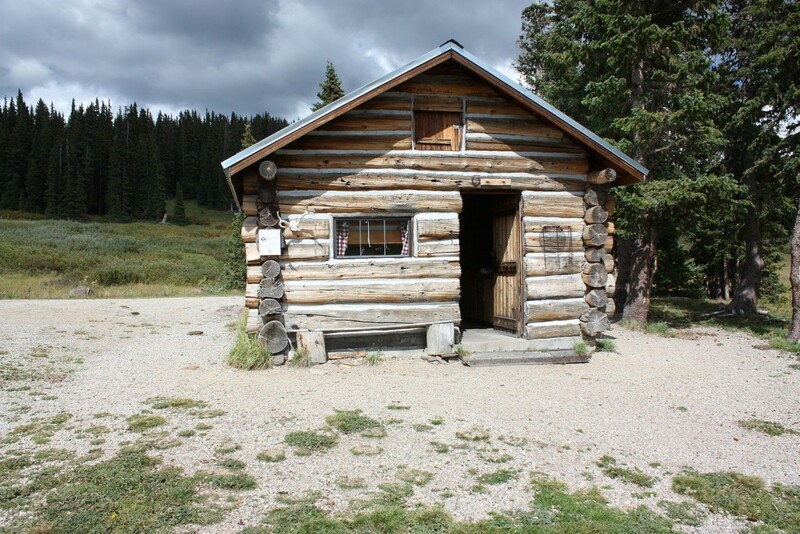 Elwood Cabin Rio Grande Forest Colorado is used under a CC BY-SA 3.0 license. 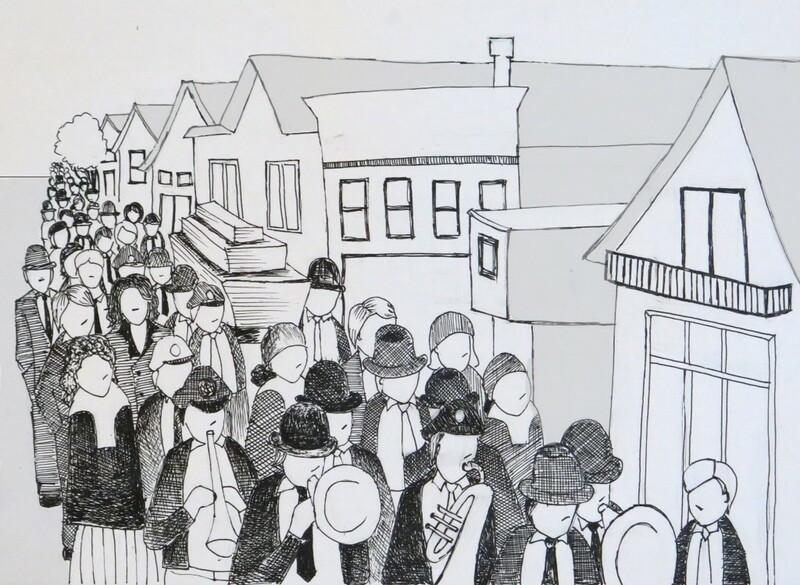 Ginger Goodwin’s funeral by Hilda Anggraeni released under a CC BY 4.0 license. The Shooting of Ginger Goodwin by Shantel Ivits is licensed under a Creative Commons Attribution 4.0 International License, except where otherwise noted.